1- Successful completion of exercises. Each subject of each module of the Professional Masters of Science in International Business or Professional Doctorates in International Business has exercises that are evaluated, which the student must work out and pass to obtain the diploma. The important thing is to learn! 2- Thesis (only for Doctorates and Masters of Science). For the successful completion of the Master or Doctorate, the student must submit a Thesis. The topic must be international business related (Foreign Trade, Global Marketing, or Internationalisation.). The Coach will be providing students with guidelines and requirements for writing the paper. If the student works in a company; he can develop thesis related to his work. The delivery of the exercises and thesis is done digitally, through our e-campus. EENI Business School & HA University encourages the creation of works group with students from different countries. Diploma (Example for master students). 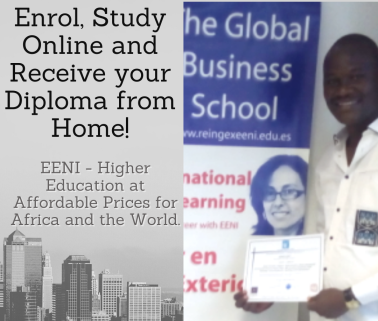 The students who complete all the exercises and thesis will obtain the master degree diploma, or course certificate for other courses, issued by EENI Business School & HA Independent University. Students with a Bachelor's Degree will receive a “Diploma of Professional Master of Science in...” (Advanced Degree Programme). In this case; it will be necessary to send us a certified copy of the University Diploma. E-learners are those people who are unable to attend regular classes because of work or personal commitments or because they live too far away from the college's campuses. Online learning, however, is not the right choice for everyone. An online learner must be self-motivated and self-disciplined. An online learner must be self-motivated and self-disciplined. Because each student is different and has different aspirations, EENI Business School & HA University allows the students to define his schedule and rhythm (the coach will help you).